Because I decided early on that I would build the model with hull hatches closed, and because little of the hull interior would be seen through the small and crowded turret, I did not make any changes in this area of the kit. Rebuilt the outer rim of the idler wheels using pieces of plastic runner (sprue) stretched over a candle. Removed the inner lip from the outer face (teethed plate) of the drive sprockets. Added the strengthening bars that run from the hub of the rearmost suspension arms (point where they attach to the hull) to a point just under the sponsons, slightly in front of the idler wheels. Filled in the gap between the front ends of the upper and lower hulls with a piece of Evergreen plastic strip. Added a length of Evergreen strip with two bolt heads, at a slight angle from vertical, on either side of the lower hull, just in front of the sprockets (see reference pictures). Added missing weld seams using thinly rolled pieces of two-parts putty set into grooves made with a dental bur where the upper hull sides meet with the sides of the glacis plate, across the front end of the hull just in front of the headlights, and also across the bolted transmission access plate. Removed the kit's front fenders and replaced it with fender stubs (fenders without the front and side flange) made from thin plastic stock. Added/replaced hull tie-downs with homemade tie-downs made from pieces of stretched sprue. Replaced the kit's stowed .50 cal MG tripod with one from a Tamiya kit and scratchbuilt a retaining arch and fastener for it using thin strips of plastic. Used PVC tape from which I removed the adhesive using solvent to make retaining straps for the pioneer tools, and thin copper wire to make assorted buckles. Replaced the kit-supplied "T" shaped tow shackles with "U" shaped ones from the spares box. Replaced the kit's incorrect gun barrel with a shortened barrel from a T-34/85 kit (not 100% accurate, but it looks alright). 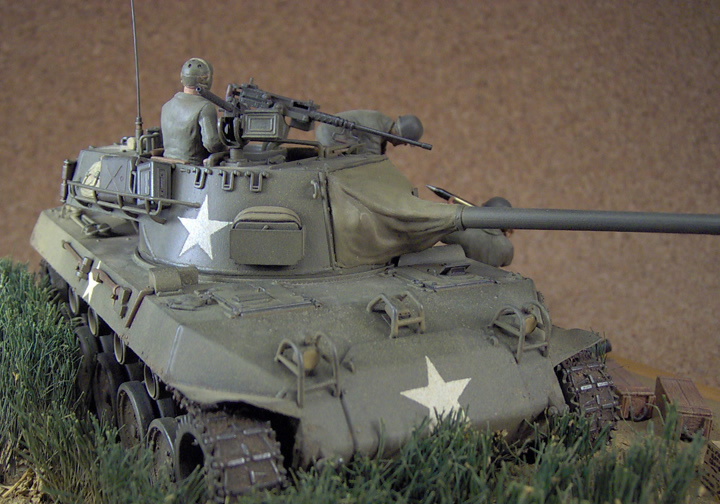 Scratchbuilt the missing gun sight based on pictures from the AFV Interiors website (unfortunately now offline). Added missing features such as grenade box (from the spares), binocular holder (scratch) and gunner's quadrant holder (scratch) on the left inner turret wall. 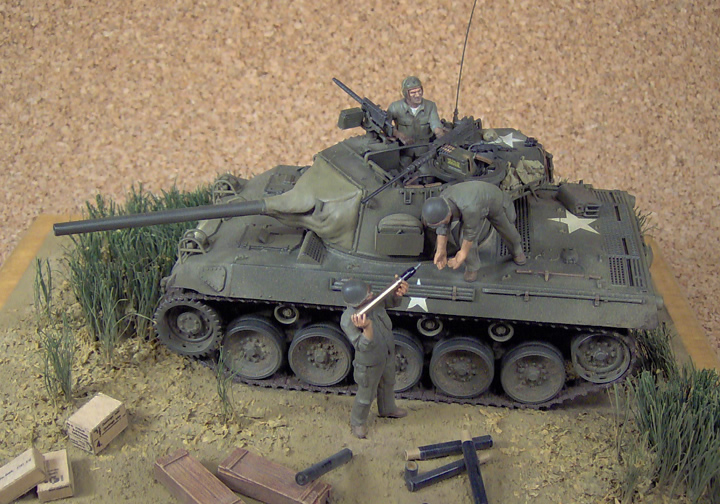 Replaced the kit's SCR-610 radio with one from Tamiya's old "US Gun & Mortar Team" set. Though not the most accurate and detailed radio around, it is a vast improvement over the kit's overly simplified part. Added some wiring on the turret traverse controls and around the base of the turret. Added a "façade" of .50 cal ammo boxes to the empty MG ammo lockers in front of the loader's position (this was cut from a .50 cal ammo locker taken from a Tamiya Dragon Wagon kit). Added a few rounds from AFV Club's incorrectly labeled "3in. & 76mm Ammo" set in the ready ammo rack in front of the loader's position (despite what the name says, these cannot be used as 3 inch rounds). Added crash pads, made from two-part putty, along the upper edge of the turret walls. Added missing weld seams using thinly rolled pieces of two-part putty along the bottom of the turret, along the joint between the turret sides and the vertical section under the turret bustle, and at the point where the turret counterweight attaches to the rear wall of the turret bustle stowage section. Scribed a vertical line on the sides of the turret bustle in line with the edge of the hatch of the stowage compartment. Added missing tie-downs along the upper edge of the turret sides. Added small mounting plates with bolt heads at the point where the two rearmost "legs" of the external stowage baskets attach to the turret walls (the basket was welded to the main body of the turret, but bolted to the bustle stowage compartment). Replaced the kit's fragile antenna guard (mine snapped when I tried to cut it off the runner) with one made from aluminum wire. Replaced the molded-on handle on the hatch of the rear bustle stowage chest with one made from copper wire. Thinned down the holders for the foul weather hoods by running an X-Acto blade edgewise along the inner face. Replicated the canvas portion of the foul weather hoods with two-part putty. Made a dust cover for the main gun mantle with two-part epoxy putty applied in layers. Replaced the ammo box for the kit's .50 cal MG with a Tamiya box enhanced with pieces of thin plastic stock, stretched sprue, PVC tape and a short length of belted rounds from another kit. 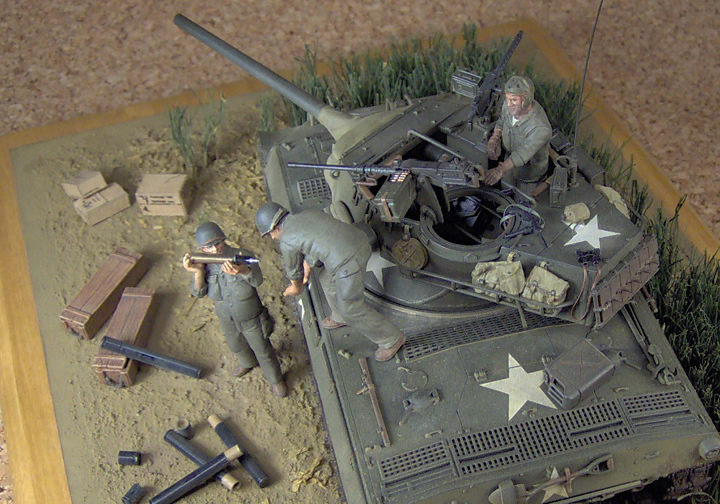 Added a .30 cal MG from Academy's M12 kit in front of the loader's position, as commonly seen on Pacific Theatre vehicles. The kit-supplied tracks are OK, even if on the thin side. I guess most AMS-struck modelers would rather use individual link replacements, but I used the kit's tracks and am quite satisfied with the results (they're glue-able and take paint pretty well). A lot of care should be taken when attaching the sprocket and idler mounts. Be sure to attach (temporarily) the frontmost and rearmost road wheels before doing so to get the proper angle/space between the latter and the sprocket/idlers. AFV Club have placed the return roller mounts too high up. They should be removed and lowered a couple of millimeters (I decided to leave them where they are). The kit lacks the strengthening bar that extends from the hub of the rearmost suspension swing arm to somewhere just underneath the hull sponson, just in front of the idler wheel. The kit's road wheels are a bit too shallow. You can either replace them with resin replacements or use them as they are and live with that (I chose the latter option). The sprockets are of a reinforced type that I have not yet seen on WWII pictures. To turn them into the correct style, you must shave off the inner lip of the sprocket's outer/teethed plate so that it is flush with the inner wall of the sprocket wheel. The idlers are among the worst parts of the kit. The main problem lies with the outer face/rim of the wheels, which are grossly misrepresented. The best option there is to just replace them with aftermarket items. I took a different route, i.e. I shaved off the incorrect and improperly molded inner lip of the idler's outer rim and glued a piece of stretched runners all around the outer edge of the those same outer rim. I then filled in the groove between the piece of stretched runners and the kit's parts with dissolved plastic (a.k.a. goop) and sanded the outer perimeter smooth. The result is not 100% accurate, but it does look more like the real thing. The main problems with the upper hull lie in the lack of weld seams and the fit of the front part where the front ends of the lower and upper hulls meet. I filled a millimeter wide gap there with a piece of Evergreen plastic strip. 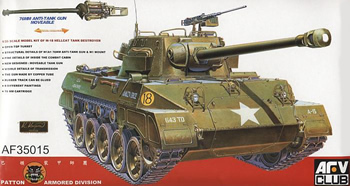 It should also be noted that AFV Club provides a very, very basic interior for the hull made up of very simplified driver and co-driver seats, an equally simplified transmission, a floor and rear bulkhead for the fighting compartment, and sponson-mounted ammo racks. I did not add anything there as I decided to build my model with the hull hatches closed. 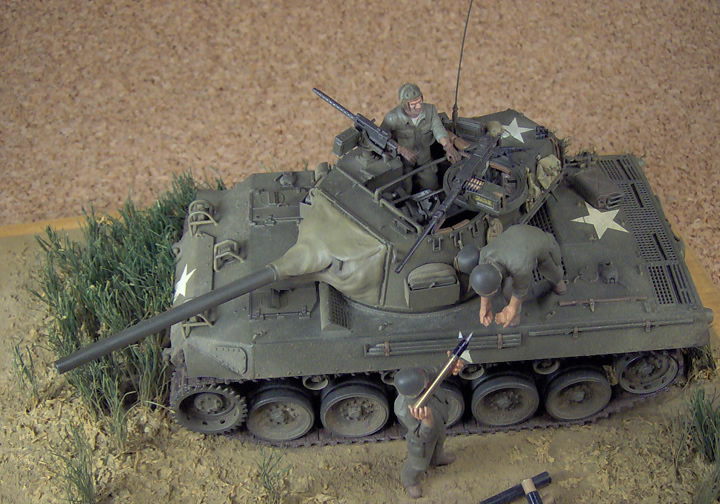 The turret is certainly the part of the kit that requires the most work, starting with the very visible interior for which AFV Club provided only very basic details. The first thing I did was to replace the featureless SCR-610 radio with an old Tamiya equivalent (from Tamiya's old US Gun & Mortar Team set). That may not be the most accurate and detailed radio around, but it is still a vast improvement over the kit part. Another big issue with the turret interior is the ready ammo locker located in front of the loader's position. 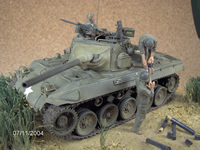 The real thing had holders for ready 76mm rounds as well as for .50 cal ammo boxes. AFV Club left the spaces for the .50 cal ammo boxes empty, and made the walls of these lockers too thick, which makes it impossible to fit ammo boxes in there. So I stole a .50 ammo locker from a Tamiya Dragon Wagon kit and proceeded to saw of the front end, which I then trimmed to have the correct number of ammo boxes and, after thinning it down, glued over the empty MG ammo lockers. All sub-assemblies were primed with Tamiya X-18 Semi-gloss Black and painted with XF-62 Olive Drab. Allied stars are from the now defunct Ordnance Depot. Paint and decals were sealed with Testors Dullcoat, and weathering included an overspray with Tamiya Buff and the application of a mixture of sifted, water and white glue on the lower parts. Ground lead pencil was rubbed on selected surfaces for a worn metal that adds weight to the whole. 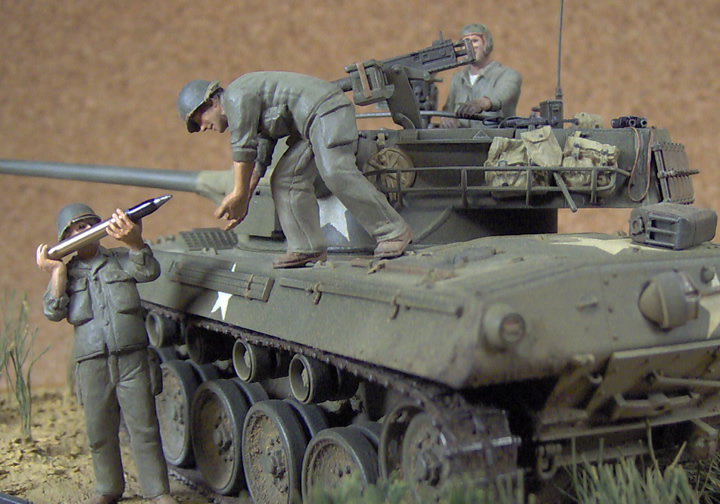 I realize that the AFV Club kit isn't 100% accurate, but without actually measuring it, I find that its general outlines look much closer to the real thing than Academy's. Hence I believe that for an equal amount of work, it can be made into a better representation of this compact, sleek looking little AFV. I tried to depict a vehicle from the 306th AT company attached to the 77th Infantry Division on Okinawa, as seen in the last pages of Concord's U.S. 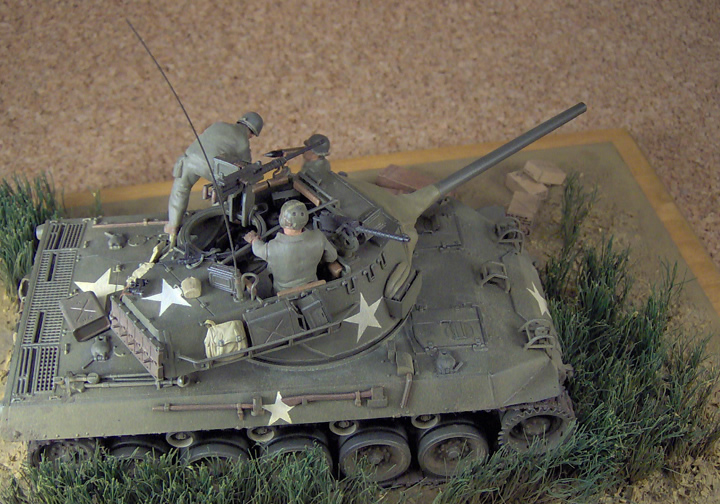 Tank Destroyers in Combat. I know this may not be the most "glamorous" setting for the vehicle, but I didn't want to cover up the model with the kind of excessive stowage more characteristic of vehicles in the ETO. Markings on these also appear to have been minimal, i.e., standard Allied stars, even though I could not find pictures showing the front end to verifiy the presence of other markings. 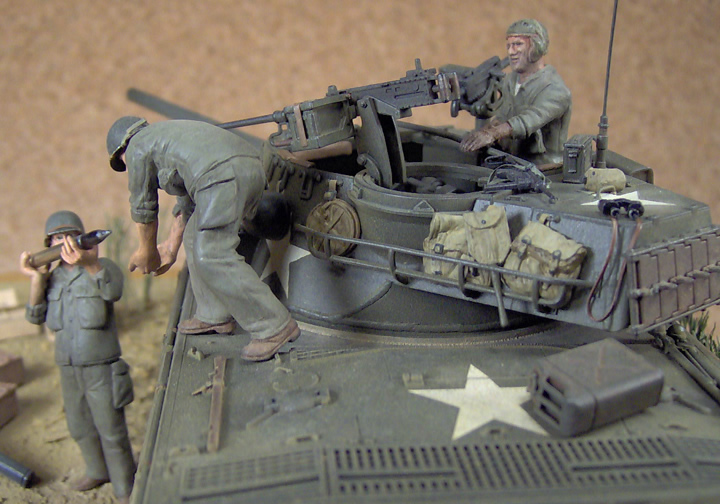 The figures are from Tamiya's "German Tank Crew Loading Ammunition" set. Those are great for converting into U.S. troops because of the loose trousers and absence of elaborate equipment. I simply scraped off their belts and used two-part putty to add the lower part of the fatigue shirts and the pockets. I also used a sharp X-Acto blade to carve the seams on the shirt and trousers, and to enhance the detail of the shoes. The heads and helmets are also Tamiya parts. The helmets are from the "U.S. MP & Harley" se,t as I find that their outline is the most accurate. The chin straps were made from black PVC (electrical) tape from which I removed the adhesive. The same material was used to make the straps on the field bags, the binoculars and the M3 "Grease Gun." 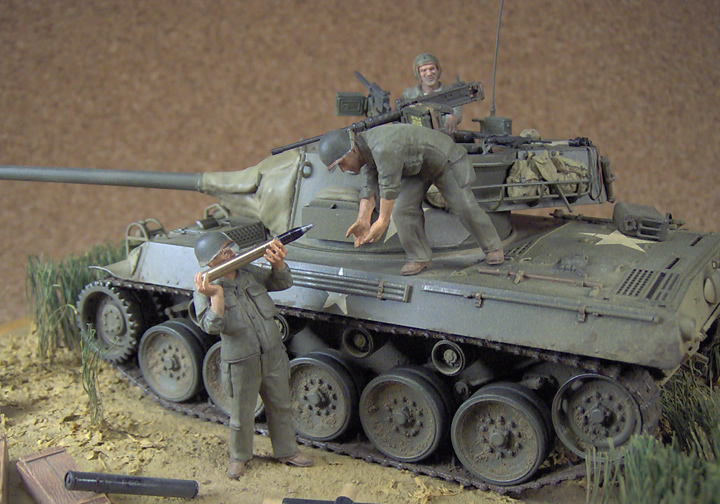 The guy standing in the turret is from Tamiya's M60 kit, with arms from an Academy set, and received the same treatment as the other two. The base is the part I'm not too satisfied with. I used plaster of Paris to make the basic groundwork, and added a mixture of fine dirt, water and white glue to texture it up a little. I also sprinkled parsley around the base of the long grass which I made from pieces of twine painted green. The base itself is a precut board I found in the arts and craft department of the local Wal-Mart. It was treated with water-based varnish.